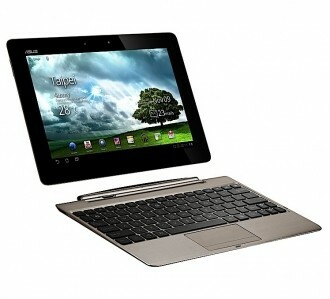 Asus is set to join Samsung with the launch of a new tablet on April 22. The Transformer Pad 300 tablet is already showing up online at select retailers for under $400 but don’t let the price fool you – this is one feature-packed slate. Powering the Transformer Pad 300 is a quad-core Nvidia Tegra 3 processor running Android 4.0 Ice Cream Sandwich. There’s also 32GB of built-in storage that’s expandable via a memory card reader, 1GB of system memory, WiFi (3G / 4G on select models) and a 10.1-inch display operating at 1280 x 800. An 8MP camera sits on the back of the tablet while a front-facing 1.2MP shooter handles video chats. A micro-HDMI port allows users to connect the Pad 300 to a television. The tablet weighs 1.4 pounds with an average battery life of 10 hours. The Pad 300 is similar to the Transformer Prime in that it can attach to a keyboard dock that transforms the tablet into a netbook / notebook of sorts. In addition to having a physical keyboard, the dock also includes an additional battery that can extend the overall tablet uptime to 15 hours. Asus first showed the tablet at Mobile World Congress in Barcelona back in February. Joining it on April 22 is the Galaxy Tab 2 7.0 which will start at $249.99 for a base model. With these new tablets and several others in the pipeline, it seems that the latest strategy to combat Apple’s iPad is to significantly undercut Cupertino at the register.